Next trip: June 19–23, 2019. Cost: From 12,500 RMB*, all-inclusive. Grasslands below the peaks of Amne Machin Snow Mountain. 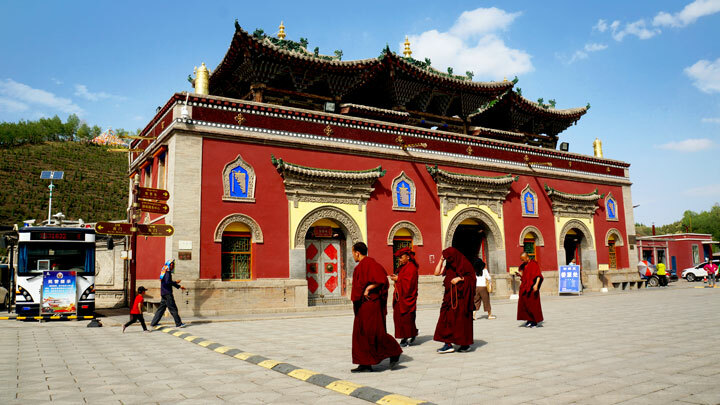 Day 1—Fly to Xining, walking tour of Kumbum Monastery, visit Xining’s Grand Mosque. 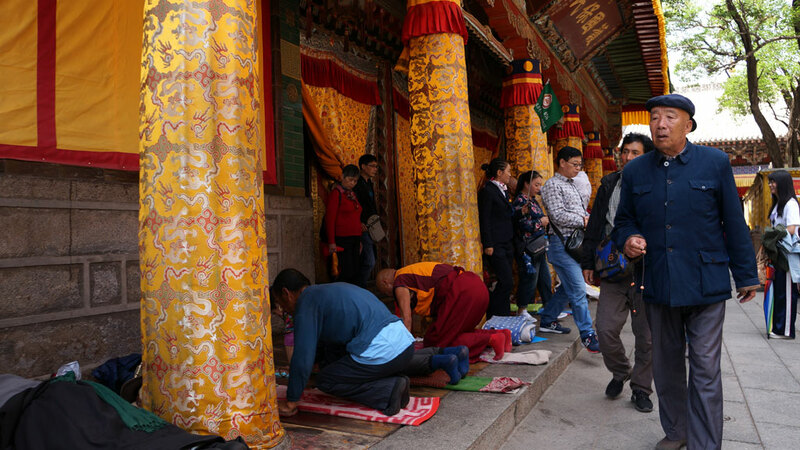 Day 2—Fly to Golog, visit Tibetan temple, visit local market. 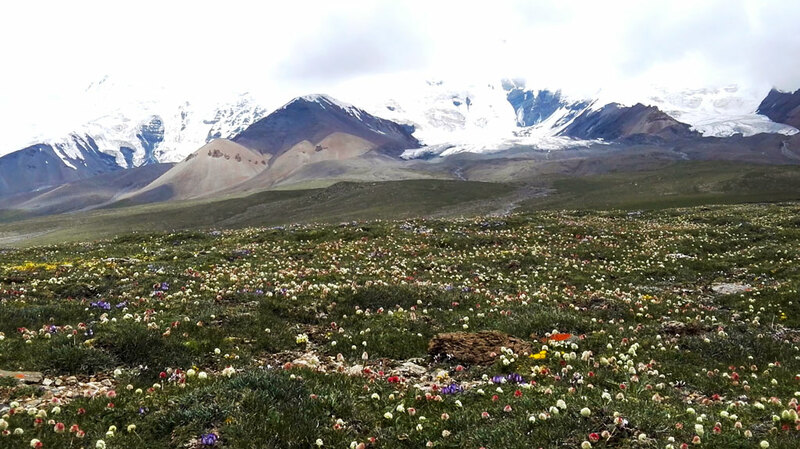 Day 3—Hike up to 4,900m in the foothills of Amne Machin. 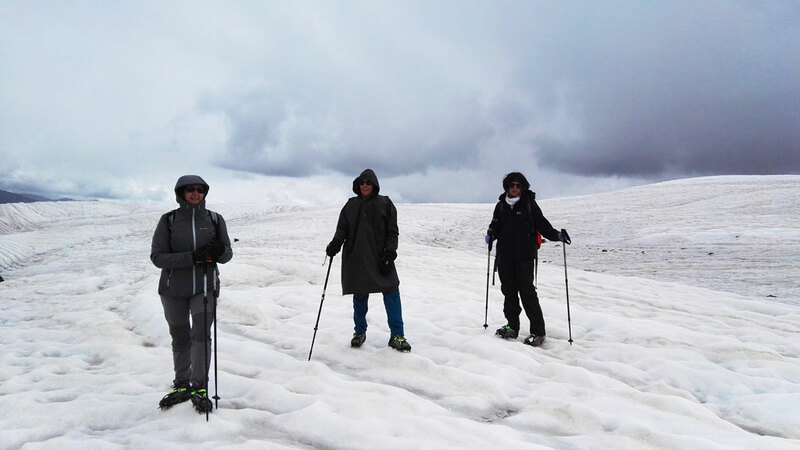 Day 4—Hike up to 3,800m to visit the glacier at Amne Machin. Day 5—Fly back to Beijing via Xining. Qinghai Province is located in China’s northwest, and shares borders with Xinjiang, Gansu, Sichuan, and Tibet. 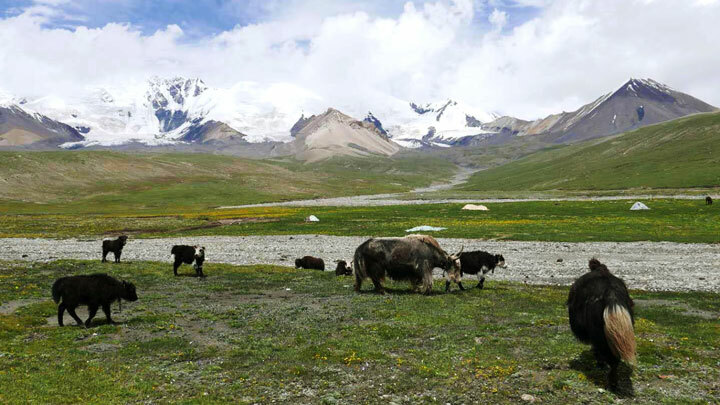 A large part of Qinghai is on the Tibetan Plateau – a vast high-altitude plateau bordered by the Himalaya, Kunlun, and Qilian Mountain Ranges. 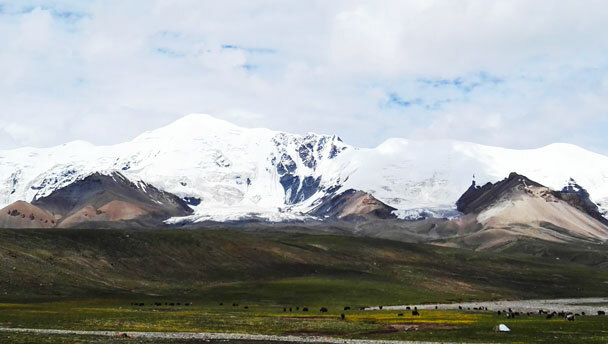 The Qinghai region was known as Amdo during the time of the Tibetan Empire. From the thirteenth to the sixteenth century, the region was under the control of the Mongols and known as Kokonur. And after the Qing Dynasty was overthrown, much of the region was under control of a family of Hui Muslim warlords known as the Ma Clique. Today in Qinghai you can find traces of that history: Tibetan Buddhist monasteries, Muslim mosques, plus a big mixture of local languages and dialects. 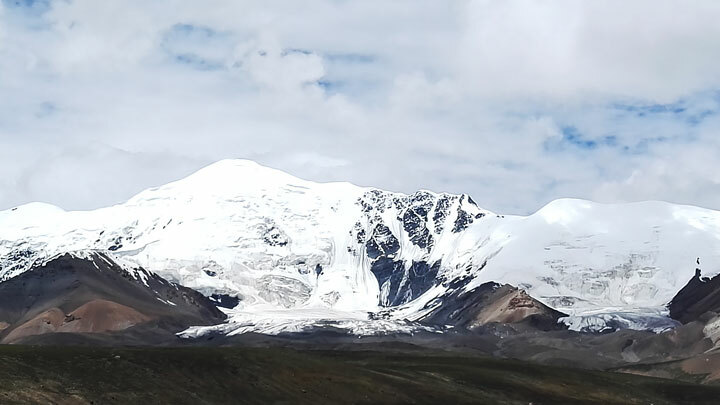 The 6,282m peak of Amne Machin Snow Mountain is the highest point of the Amne Machin Range, which itself is part of the Kunlun Range, one of the main mountain systems of Asia. In Chinese legend, Amne Machin is where Emperor Yu the Great ‘tamed the flood[ing]’ Yellow River, which is partially fed from snow melt from the mountain. In Tibetan religion, Amne Machin is said to be the home of Machen Pomra, the main deity of the Amdo Region. 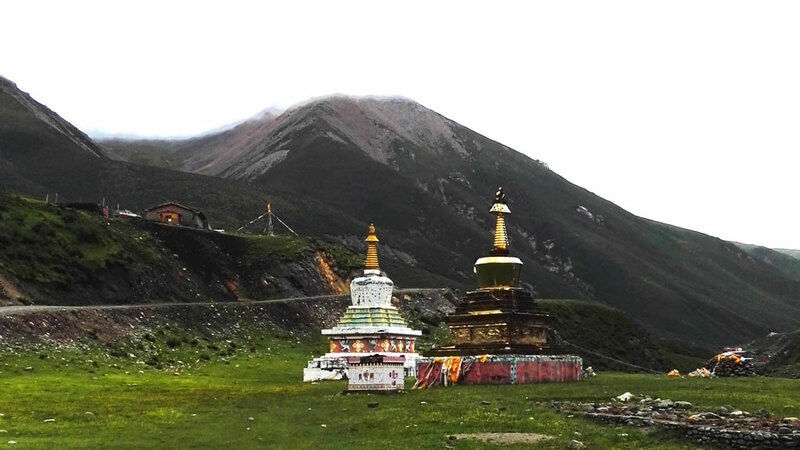 It’s a holy mountain, and pilgrims still come to walk the nearly 200km loop around the peaks. A minor peak of the mountain was climbed in 1961, and the main peak was unclimbed until 1981. 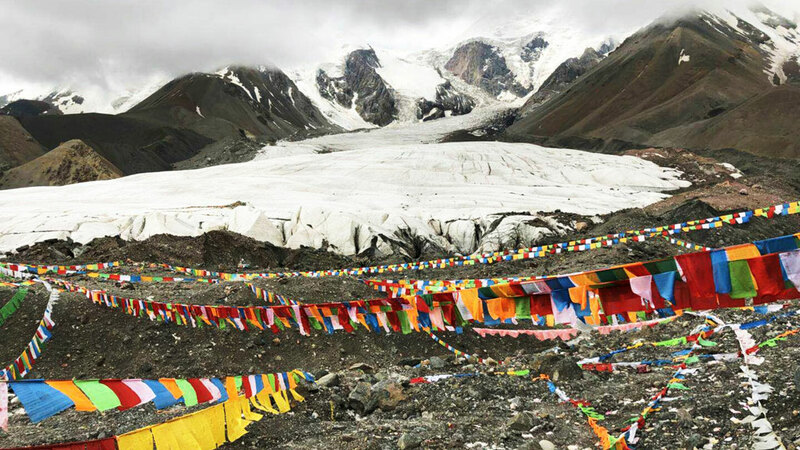 Amne Machin is located in Golog Tibetan Autonomous Prefecture, a mountainous area in which the population is 92% Tibetan. 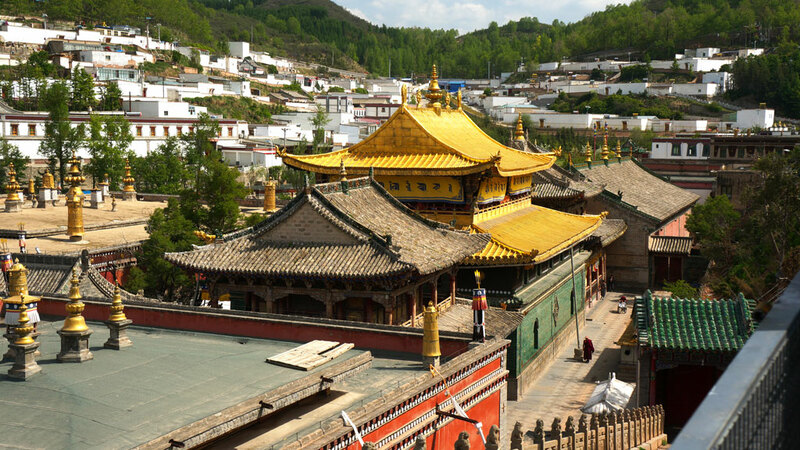 Kumbum Monastery is a monastery of the Gelug ‘Yellow Hat’ sect of Tibetan Buddhism that was established in the 1580s at the site of the birthplace of Je Tsongkhapa, the founder of the Gelug sect. Before the 1580s, there had been a small temple with a stupa to mark the site of his birth. Tradition has it that a sandalwood tree had also grown up, and that the leaves and the bark of that tree had markings that looked like Buddha’s face. The temple that was built around the tree is the holiest place in the temple. The tree is no longer standing, but the temple is still there and houses parts of the tree. Kumbum has important (and interesting!) 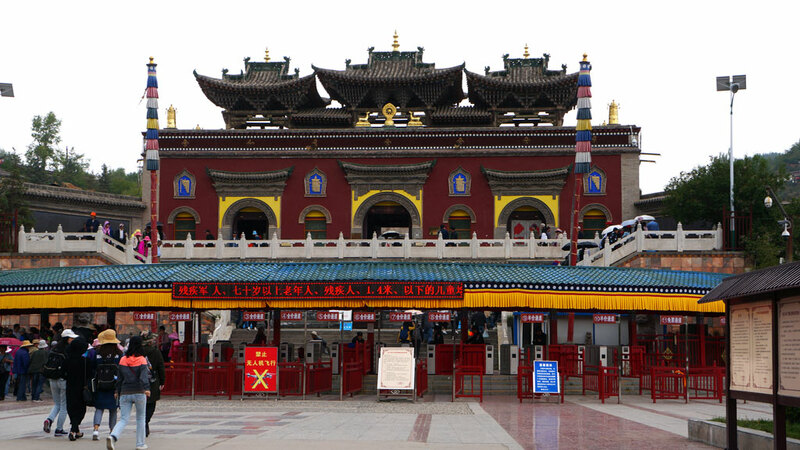 connections to the three main monasteries of Lhasa, and it’s in this area that the third – and also the first – Dalai Lama was given that title. 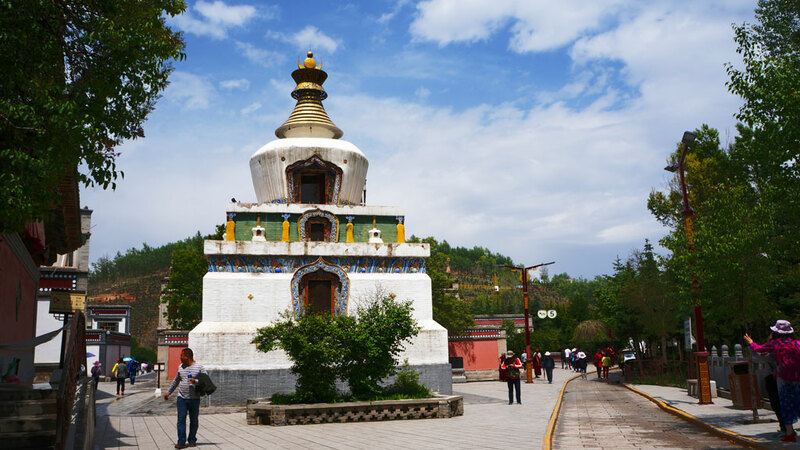 Je Tsongkhapa, born on the site of Kumbum, founded Lhasa’s Ganden Monastery in 1409, and it became the main seat of the Gelug tradition. Two of Tsongkapa’s disciples founded the other two main Gelug monasteries – Drepung Monastery, and Sera Monastery – both in Lhasa. In the 1500s, Sonam Gyatso – who would become the third (but actually first) Dalai Lama – became the head abbot of both Drepung and Sera Monasteries. This made him a very important spiritual and political figure in Tibet. Around the same time, Altan Khan was ruler of roughly half of the Mongolian tribes. As the story goes, only a direct descendant of Kublai Khan would be eligible to rule the whole lot … and Altan Khan was not a direct descendant. What to do? A political and spiritual solution was found. 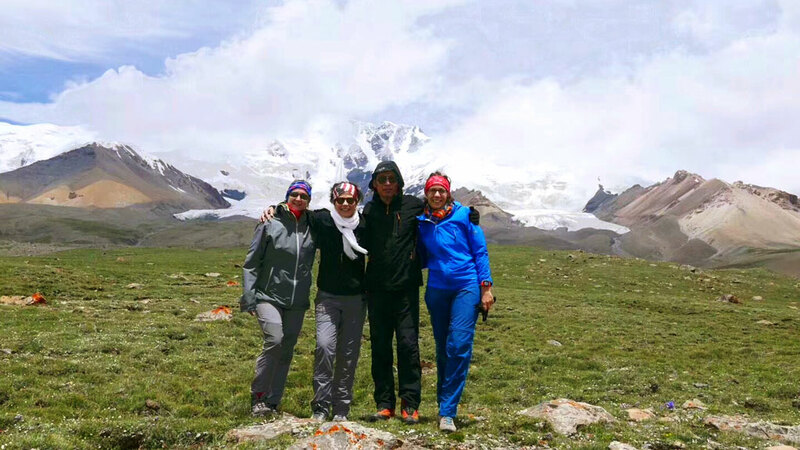 Sonam Gyansto was invited to meet Altan Khan near Qinghai Lake. After that meeting Altan Khan became eligible to rule all the Mongolian tribes, and Buddhism became the main religion of his subjects. How? Again, as the story goes, Sonam Gyatso announced that he had recognised Altan Khan as a reincarnation of Kublai Khan, and that he himself was a reincarnation of the Tibetan monk who had converted Kublai Khan to Buddhism. Altan Khan then gave Sonam Gyatso the title ‘Dalai Lama’, and announced that the two had come again to promote Buddhism to Mongolians. Very convenient! So why was Sonam Gyatso actually the third Dalai Lama, even though he was the first to have that title? The title was later conferred on his two previous incarnations. And, in another convenient coincidence, Altan Khan’s great-grandson was identified as Sonam Gyatso’s reincarnation and became the fourth Dalai Lama. Now that was a productive meeting. 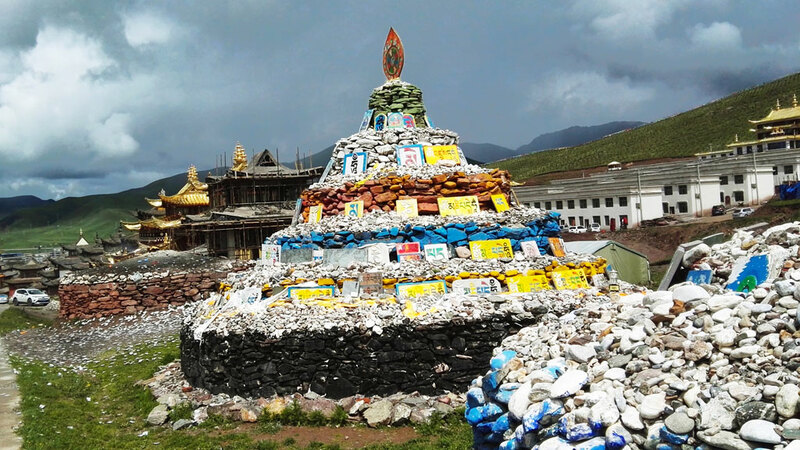 It’s not finished yet, though – it was on the way to his meeting with Altan Khan that Sonam Gyatso toured the small temple at Kumbum and ordered it expanded into a monastery fitting of the birthplace of the founder of the Gelug sect. We’ll do a walking tour of the Kumbum Monastery on the first day of this trip. During the trekking part of this trip we will be at high altitude, and will arrive without a whole lot of acclimatisation. We take the issue of altitude sickness seriously. 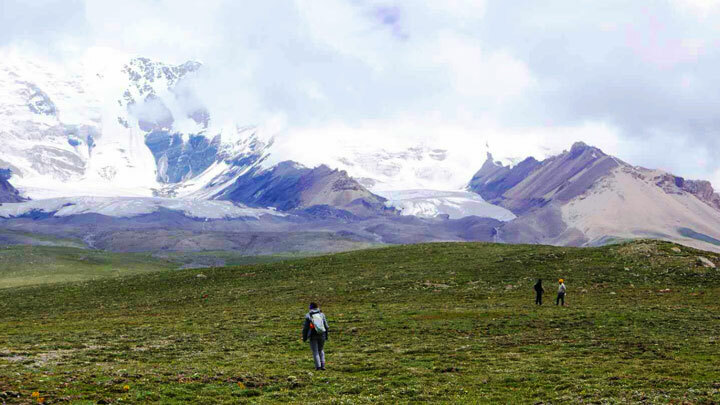 If anyone has serious problems with the altitude, one of the BJH guides will take them back to Xining straight away. If anyone has problems after that, they’ll be transferred back and met by the guide. Any extra costs incurred for transport/medical assistance are to be paid by participants. We will purchase insurance on your behalf, but you must be prepared to cover any up-front costs. 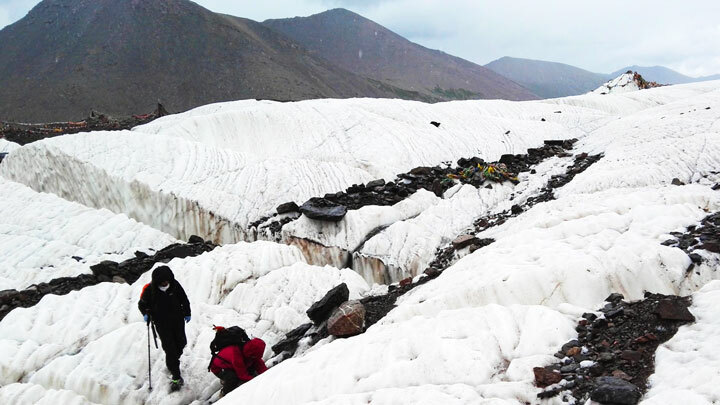 At high altitude, the weather may change suddenly for the worse. We reserve the right to alter the itinerary to ensure the safety of all participants. We’ll be flying to and from Xining and Golog. Other travel during the trip will be in a comfortable private vehicle. Warm clothes, warm hat, thick socks, scarf and gloves. Wet tissues or hand sanitizer. Altitude sickness medicine, just in case. A Chinese medicine named Hongjingtian (红景天) can be found in some pharmacies in Beijing. Day pack for carrying water and snacks while hiking. 16 photos from a trip to the glaciers of Amne Machin Snow Mountain.